Even the strongest critics of the 1978 Constitution will have to agree that it is a well-constructed piece of legislation with an architecture which is internally consistent. While a Constitution ensures the citizens their rights, the right of representation in particular, it also gives the Government the powers to govern. In regard to this representation v. stability tension in a Constitution, the 1978 Constitution essentially improved on representation by introducing proportional representation (PR), but took away with the other hand the powers of the representatives. It gave the President excessive power over the Parliament, Prime Minister and the Cabinet of Ministers, presumably to balance representation with governability. The political landscape since then then, since 2015 in particular, has been consumed with the abolition of the Presidency, but, what seems to be possible is a gradual repeal of the powers of the Presidency. The first success came in the form of the 19th Amendment to the Constitution. The latest is the news that the Janatha Vimukthi Peramuna (JVP), dissatisfied with the lack of progress of Constitutional Assembly, intends to bring a Private Member motion to abolish the Presidency. Closer inspection shows that it is nothing more than an attempt to further strip away of the powers of the President and change the mode of election of the President from election by a popular vote to election by the Parliament. Parliamentary procedures allow only two weeks to respond to a Bill before it is taken up in Parliament. In that regard, it is fortunate that the ‘Aluth Parlimenthuwa’ talk show of Derana TV gave us a glimpse of the proposals. What’s to come has to be evaluated against what has been, here and elsewhere. First, a few words about our own experiment in 2015. “People have given the green light for a bold new step to do away with the executive presidency. The next 100 days are crucial as the form and shape of the new presidency emerge. The Maithri manifesto talked about a redefined presidency representing national unity and taking on other responsibilities as needed. Mr. Maithripala Sirisena has the ability to make it much more. If executive presidential powers are given away as promised, it will give the new President a moral authority like no other president will ever have. Going beyond the curbing of corruption, rule by family and friends and other ills, he can be the upholder of values of the nation to guide the new regime from that vantage point and, more importantly, help us rebuild our values as a people (Gamage, Colombo Telegraph, 10 January 2015). In a turn around, Sirisena accepted the leadership of his old Party and became a hundred percent political President. The reasons and the context need a dispassionate analysis and we should not totally give up on the idea of a one-term and/or an apolitical President, I believe. Many countries in Latin America and Philippines here in Asia have term a limit of one for their Presidents. We should keep that option on the side-burner as we deliberate. The 19th Amendment to the Constitution brought many changes. Most important in the present context is the restriction on dissolution of Parliament by the President for four years and six months from the previous one-year limit. Other important changes are the reducing of the term of office of the President from six years to five years; reintroducing the two-term limit, and dual citizens being disqualified from being elected to the office of President. The President still remains the head of the Cabinet of ministers essentially giving him a grip on the Government (or the political apparatus) as well as State (or the executive apparatus). 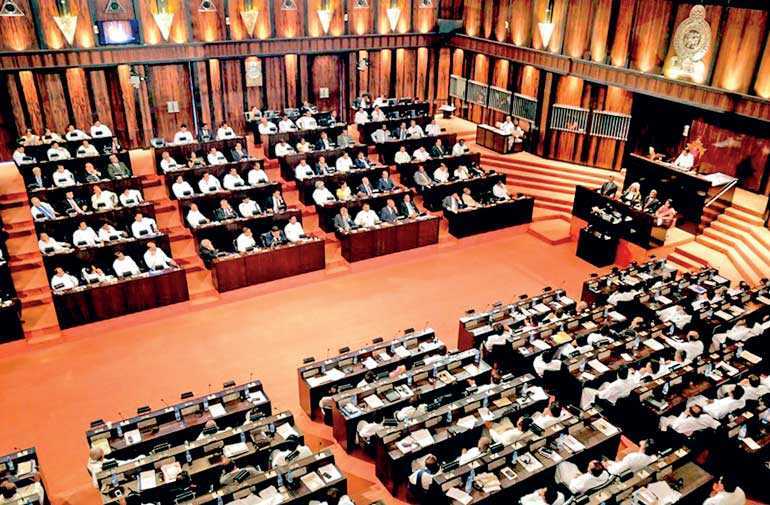 The Amendment sought by the JVP seems to address the issue and more. At the Aluth Parlimenthuwa Talk show by Derana on Wednesday, Vijitha Herath, Parliamentarian representing the JVP, outlined what is envisaged. Also attending the program were M. Thilakrajah, MP, Shiral Laktilake, the Coordinating Secretary to President, Udaya Gamamnpila, MP, representing the Joint Opposition, and the lawyer Kanishka Vitharana representing civil society. My own take on the JVP’s proposal is a measuredly positive one. For the time being let me simply outline what I heard watching the program. As Herath explained, the President shall be elected by Parliament from among any individual qualified to run for President as currently defined in in the Constitution. If a Parliamentarian is elected he/she has to resign from the post. The President shall be the commander-in-Chief as now and will retain all powers in relation to the Provinces, the land and police regulations in particular. However, the President will not be the head of the Cabinet or the even a member the Cabinet, but the President can be informed by the Secretary to the Cabinet about any and all proceedings of the Cabinet. Further the President will not be appointing Secretaries to the Ministries, diplomats or grant pardons on his own. Those have to be approved by the Cabinet or the Constitutional Council as appropriate. Thilakrajah sorted out the various incarnations of the 20th Amendment so that people are not confused. The first Bill presented in July 2015 was on electoral reforms, but became and null and void after the Parliament was dissolved soon after. The second version was for the purpose of holding Provincial Council elections on the same day, and postponing elections to some as part of the process. That amendment was ruled unconstitutional by the Supreme Court, though it still remains on the Order Paper of the Parliament creating some confusion. The JVP’s attempt is the latest version of a 20th Amendment and it concerns the Presidency. An important question posed by Thilakrajah was as to why JVP does not go all the way and bring an amendment which encompasses the proposals of the Constitutional Assembly. Herath responded by pointing out that they are looking at what is possible, not what is optimum. Lakthilake correctly noted that there is no vision or a sense of the overall architecture in the constitutional reform process and we need to proceed carefully. Gammanpila was concerned that a Private Members Bill could be used by the Government to sneak in other legislation. Herath, responded by noting that they are at liberty to withdraw the Bill if such happens. As lawyer Vithanrana pointed out, the governor’s powers derive from the President and if the President does not have powers over the National Government, the new role of the governor over the Provincial Government needs to be assessed. Thilakrajah pointed out the critical point about disadvantages to the minorities in the proposed Amendment, but recognised the overall benefits as well. As critical to the discussion is the electoral method and stability of the resulting Parliament, I felt, but it was not discussed adequately. More often than not, PR gives hung Parliaments or Councils causing ungovernable situations. Germany recently was without a government for a considerable length of time and it took Spain a second round of elections and nearly two years to form a government. Both countries use PR based electoral systems. Back home in Sri Lanka, we witnessed difficulties in returning Chairman and vice Chairman in our local Councils when we used a Mixed-Member PR method of elections. The difficulties were wrongly attributed to the Mixed-Member Method. The reason was in fact the overall Proportional nature of the method, and the problems would have come up even with the old PR method. The splitting of the SLFP and the resulting four way contests instead of the usual three way contests are the real reasons for instability. In the future, the political landscape can be become more complex, but we need to take long hard look at the standard argument that an executive presidency is needed to face these uncertain situations. Unfortunately, in this country we seem to be making policies by Committees where some bureaucrat seem to be charged with the task of putting together opinions of Committee Members with summaries that end up as bullet points. The country needs a process guided by a vision and a sense of the underlying architecture, to yield a coherent document out of the report of the Steering Committee of the Constitutional Assembly. Right now this is just a wish list. The JVP’s initiate should serve as a jolt to policymakers and civil society as well.